The first Monday in May is reserved- in the fashion world- for the Metropolitan Museum of Art's Costume Institute Gala fundraiser. 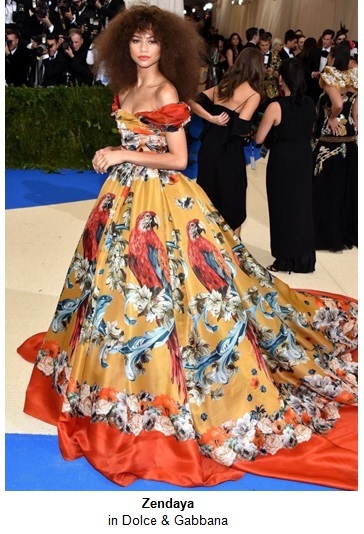 More commonly known as the Met Ball, an annual theme is chosen by the co-chairs and celebrated with a night of haute couture. This year's theme was centered on a specific designer (which rarely happens): Rei Kawakubo, the founder of Comme des Garçons. Known for her avant garde and unconventional creations, it was interesting to see how celebrities incorporated (or steered clear of) the theme. Here are my best-dressed from the red carpet. As one of Karl Lagerfeld's muses, Lily-Rose Depp was bound to wear Chanel. Her look was flawless, and the shocking pink color and wrapped rose branch embellishment made this elegant gown stand out. Lily Aldridge was showstopping in a Ralph Lauren cutout gown. What really made her look chic were the accessories: red Balenciaga pant-boots and sheer pink veil made by her hairstylist Bryce Scarlett. 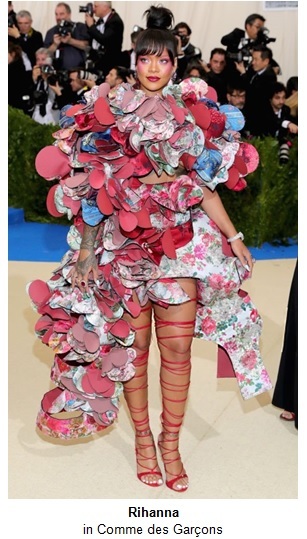 Rihanna was one of the very few celebrities who wore one of Rei Kawakubo's designs. For this reason alone she gets major points from me, since paying homage to the theme is central to the Met's history. As someone who can seemingly pull off almost any fashion risk, she chose a piece from the Fall 2016 collection that brought attention to the intricacies and art of haute couture. Going in a different direction, Ralph Lauren's simple but chic low-cut red gown looked fabulous on Rose Byrne, whose red curly hair gave it a retro vibe. Speaking of hair, Zendaya's teased-out, long afro gave her look a gorgeous ethereal feel. The voluminous and printed Dolce & Gabbana dress didn't overpower her. When a celebrity can wear this look and not let the look wear her, you know she is one to watch on the red carpet. Wearability aside, it's always inspiring to look to the Met's red carpet for over the top looks and aesthetics that push the boundaries of fashion. As Rei Kawakubo said, "for something to be beautiful, it does not have to be pretty". Who were your favorites from this year's Gala?